Let me see if I'm the only weirdo out there. If I eat something fully savory (salty) I need to indulge in something sweet after, every time. Same thing goes for the other way around. Example: the other weekend my husband and I ate at our little town's new Chipotle (can you say EXCITING!??!?!!??). Chipotle = Salt Central. Delicious Salt Central. But Salt Central none the less. As soon as we were done my brain and taste buds informed me I needed sweet. Stat. So like the true fatty I was, I informed my husband that we then needed to head over to Yogurtland to get some froyo (froyo? who says that?!) Yes, after devouring a WHOLE Chipotle meal, I indeed needed more food- a sweet something. We did walk over to that frozen yogurt. If that makes things better. But here's the kicker. After eating what could have been the BEST FROZEN YOGURT CONCOCTION I HAVE EVER MADE AND EATEN ALL IN ONE SITTING, I needed salty again! Story of my life. Does this happen to you? Because it seriously occurs after every meal I eat. There are though, some things I like to call "heavenly treats"- food items that include both a salty and sweet kick. These food items are my favorite. We're talking: chocolate covered pretzels, bacon chocolate bars (oh yes, these DO exist), sea salt chocolates, fruit with salt and lemon, etc etc. After consuming one of these I'm good to go (or I just eat the whole darned bag/bar/box). Food is so my guilty pleasure. Here's another sweet-salty love of mine- Salted Caramel. Oh heavens do I love myself some salted caramel. Make salted caramel into a piece of dark chocolate and sprinkle more salt on top- SWOON! Even better. Spread salted caramel between layers of decadent cake, add chocolate somewhere in there, more salted caramel for kicks, and you've got my heart for life. There's just something utterly divine about the flavors of burnt sugar and cream, and salt. It hits all the right spots on the taste bud chart, eh? 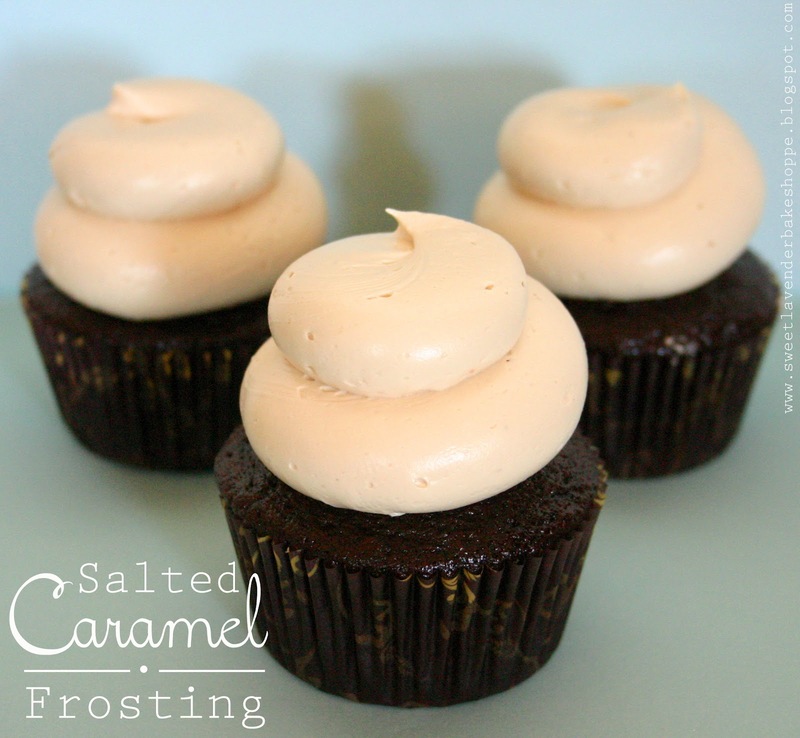 I know there are a lot of salted caramel frostings out there and I'm not about to say my version is the best- BUT I will say it's darn good. I love it. I make it a lot, and it suits me just fine. Having a French cooking background, I tend to do things inspired by their techniques. I find them therapeutic and comforting. Sure it may be heavier in the "steps" department, but the end product might give all those others a run for their money. Here, you'll find a classic Swiss Meringue turned into a classic Swiss Buttercream Frosting- and then salted and caramelized. It's silky, it's fluffy, it's heaven on a finger..err....cake. Over a pot of continually simmering water, create a double boiler with your stand-mixer bowl (or a bowl that fits on top of a pot). Add egg whites and sugar into that mixing bowl and continually whisk until sugar granules are no longer felt when rubbed between fingertips, about 5 minutes. With whisk attachment, whisk your egg/sugar mix in stand-mixer on medium-high until egg whites form stiff peaks and are completely cool. 10-15 minutes. You're essentially making swiss meringue here :) You'll want to make sure your meringue is absolutely completely cool before proceeding. With mixer on medium low, add butter one square at a time to the egg white/sugar mix. Continue to do this until all butter is incorporated. Add vanilla extract. Set aside (keep room temperature and in bowl). Cover top with plastic wrap and allow to sit on counter for next steps. Combine heavy cream and vanilla. Set aside. Mix sugar and water in small saucepot, over medium high heat. After it starts to boil, DO NOT STIR. Cook (watching the whole time) until your sugar reaches a dark amber color. Turn heat down to low and SLOWLY start to whisk cream mixture in, whisking whole time. Add salt. Bring back to a simmer. Pour into bowl and cool until room temperature. Re-whip buttercream for a few seconds. While buttercream is beating (with a whisk attachment) slowly add cooled caramel sauce. Scrape down sides. If using that day, keep room temp. Taste. If it's not salty enough for you, add more sea salt little at a time until your desired saltiness is achieved! *If using later- place buttercream in an air tight container and refrigerate for up to 3 days (freeze up to a month). If refrigerated, when ready to use, just bring back to room temp and beat with a paddle attachment until nice and fluffy! If frozen, defrost overnight in fridge, then follow refrigerated instructions for bringing back to room temp! Tastes great on chocolate OR vanilla cupcakes/cake...or right on a spoon. We are once again Twins!! I LOVE salty and sweet!! I dream of inventing the best salty\sweet combo in the world. I never knew what good caramel was until someone gave me a few pieces of gourmet salted caramels. Swoooon!!! I wish I had a magic spoon so I could look the frosting right off the screen! Please oh please oh please!!!!! I MISSSSSSSSS YOUUUUUUUUUUUUUUUUUUUUUUUU ;(((((((( <-- Thats my emoji version of a crying Dawson face for you. Where do you get your awesome cupcake papers? Where do you get your awesome cupcake papers from?? I get them at a variety of places- I kind of have this addiction! If I'm out and see cute ones, I snag em! These in particular I think I purchased at my local Michael's craft store. O.k. So you are officially my new Heroine.. that's as in the female version of hero.. not the drug..
-This just Has to be made! Oh! And speaking of frozen yoghurt; I saw today that Copenhagen (where I live), have Finally opened their first frozen yoghurt place! The one thing I craved ( after Big Macs and Champagne) when I was pregnant, was frozen yoghurt so I'm delighted! Obviously none of this was devoured during pregnancy, well, maybe the odd big mac..
Hehehe you made me giggle!!! Thank you for the kind words! Thank you for commenting- this made my day! I love to hear about my readers! GO FROZEN YOGURT!!! Eat away! These look so billowy and delicious! It's a must try! I actually made this recipe over the weekend and it turned out wonderfully! I used it to frost a pumpkin spice cake, and it was a huge hit. Thanks for the tips about the meringue, I was very careful and it worked out beautifully. Let me see if I can answer all your questions! For one- there are a few diff types of Buttercream- French, Swiss, American, and Italian. The difference being, in the egg prep/if there are eggs at all! So for Swiss Meringue Buttercream, you always slightly warm the egg/sugar mix. French you don't, and Italian you create a sugar syrup which gets the egg white the hottest! There are a few things that could have gone wrong: 1. You over cooked your egg white/sugar mix. 2. Your mixture wasn't completely (and I mean, COMPLETELY) cool to the touch before adding your butter. 3. Your butter was too warm. It needs to be slightly soft. Not almost mushy like you'd need if making cookies. 4. You didn't mix enough. I know you said you mixed for a very long time- but sometimes depending on the weather/heat of mixture/heat of butter I've had to mix my buttercream for 20+ minutes while rubbing ice packs under the mixer bowl. It almost ALWAYS will come together. I promise! So I encourage you to try again! And if it looks separated again, please don't fret- just continue mixing while rubbing ice or ice packs under the bowl and I promise it will come together!